My husband, Stacy designed and built this Double Door Dog House for our sweet fur babies. We are proud parents to 2 mixed breed dogs, both live outside and 2 indoor tabby cats. We lost our sweet Phoebe Lee to Canine Cancer. She had a very nice dog house with a porch that my husband built many years ago. Unfortunately our 2 boy dogs just refused to get in it together and snuggle. Hence, a brand new double dog house custom built just for them. These are not detailed plans. They don’t include the base or the roof. 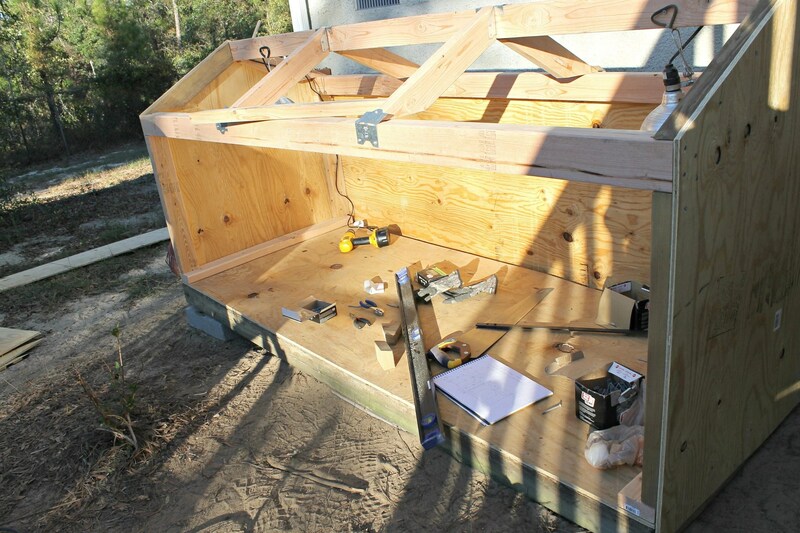 He used the base from the old dog house which is approximately 38″x 96″. The plans for the roof are not included either but I will give some details later. The base is resting on concrete blocks and was leveled prior to adding the walls. Notice that tiny little shrub. That is one of two little baby hydrangea’s I planted back in the spring. I was assured that my hydrangeas were a No. 1 Priority during the building of the new dog house. Those will be transplanted to a new location in the spring. 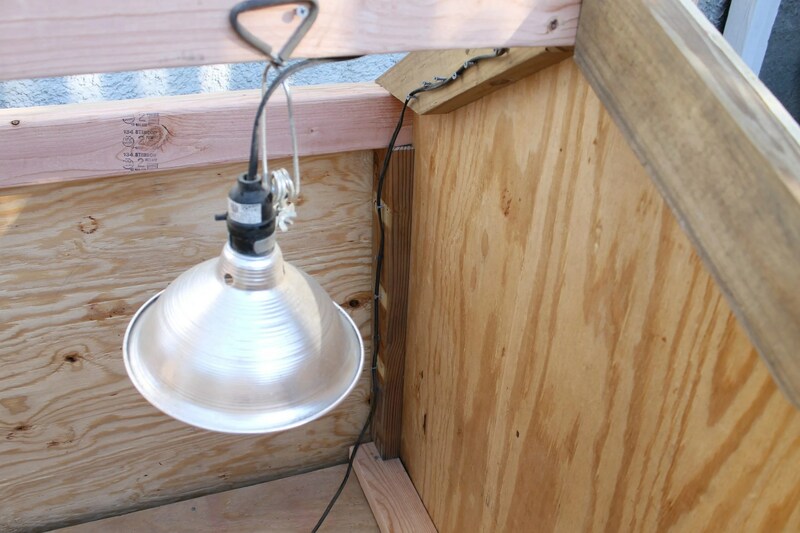 This location was selected due to the proximity to an exterior outlet perfect for plugging in the heat lamps. It is also located right next to the front porch facing the front of yard so the dogs can still see the world go by. 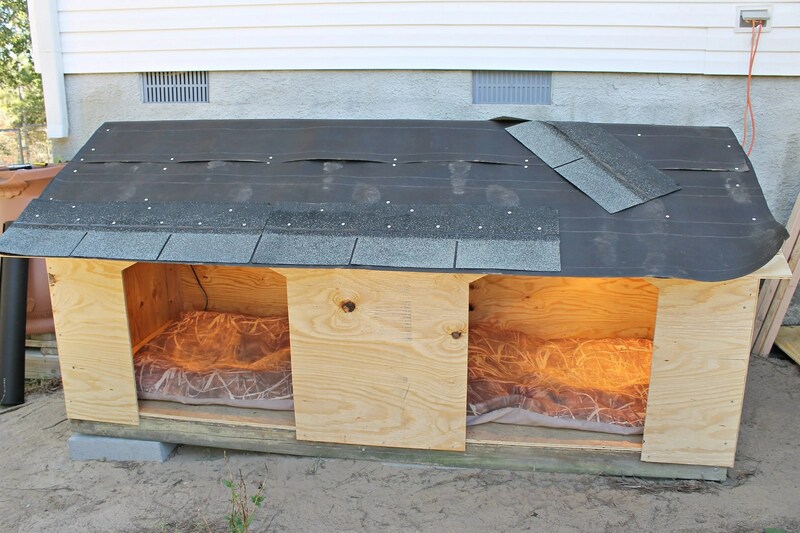 Prior to adding the front of the dog house, go ahead and install the heat lamps. They clamp right onto the ridge beam easily. Install screws as shown for securing the cords safely out of the way. The front is actually in three pieces. You can see the seams in the peak of the entry door. The front wall was screwed into place rather than nailing in the event that removal was ever necessary for any reason. You can see there is a small divider between the 2 sides. Our boy dogs don’t snuggle with one another. The divider is removable and also optional. 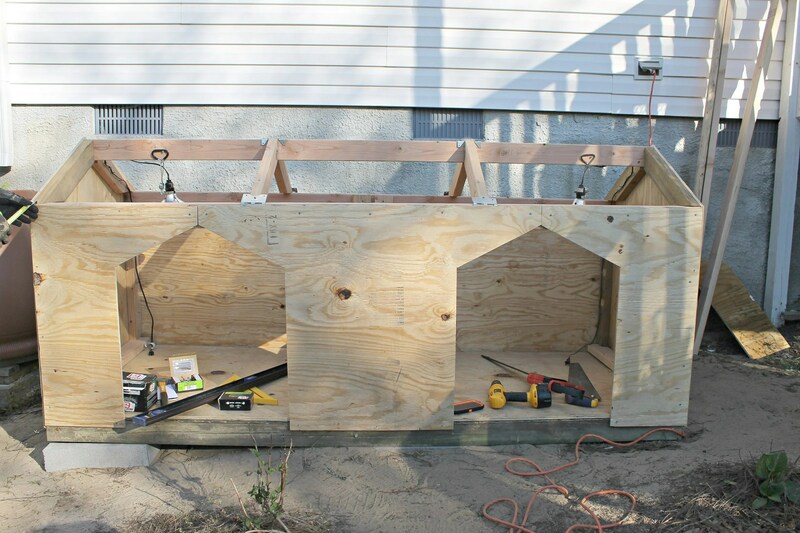 If you are building a double dog house like this one, you do not have to add a divider. Time for the roof. The back is in one piece but notice the arrows showing that the roof on the front is in 2 separate cut pieces. The longer piece in the lower front allows for a 9″ over hang. Dog beds in place! Rolled roofing goes on before the shingles. All done! We fed them their evening meal inside of it to entice them inside and get them acclimated. It worked and I’m happy to report that both dogs went right on into their new house and curled up in their beds. Now, their new home needs some paint and gutters! Orbit. He keeps his tennis ball close by at all times. You never know when a game of fetch might break out. We got Orbit out of a box at a shopping center almost 10 years ago now. Just a puppy when he came to live with us, He is literally the perfect dog. Orbit is a mixed breed which is the very best kind of dog if you ask me. 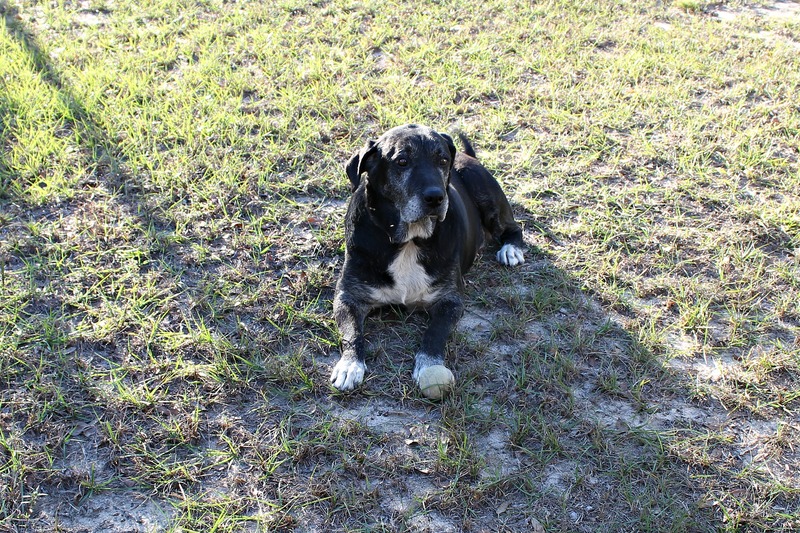 Six Toe, a mixed breed, is about 12 years old according to the Vet. He suffers from a bacterial skin infection which has cost him a large portion of his hair. Med’s help, but the hair will never grow back. His name is Six Toe because he actually has 6 toes! He was a stray which took up at our house a few years ago very frail and hungry. He is a sweet boy whose favorite part of the day is meal time. His appetite is tremendous, especially for his age. After getting a bath, he goes and rolls around in the dirt for a good 15 minutes while we watch and laugh. He turns himself in circles rolling around in the dirt! We have to keep our fur babies warm in the winter! « What Is Trending On Your Blog ? My name is Rachel Murphy and I’m a news editor with Care.com. 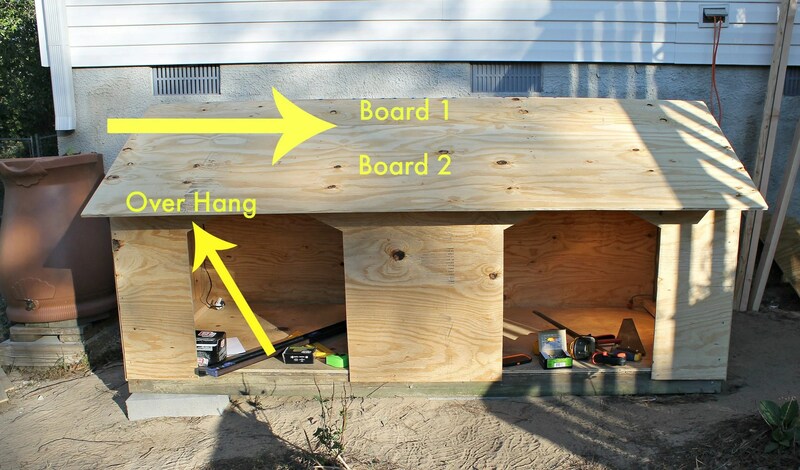 We would like to include this dog house tutorial in a round up of DIY dog house plans for our website. 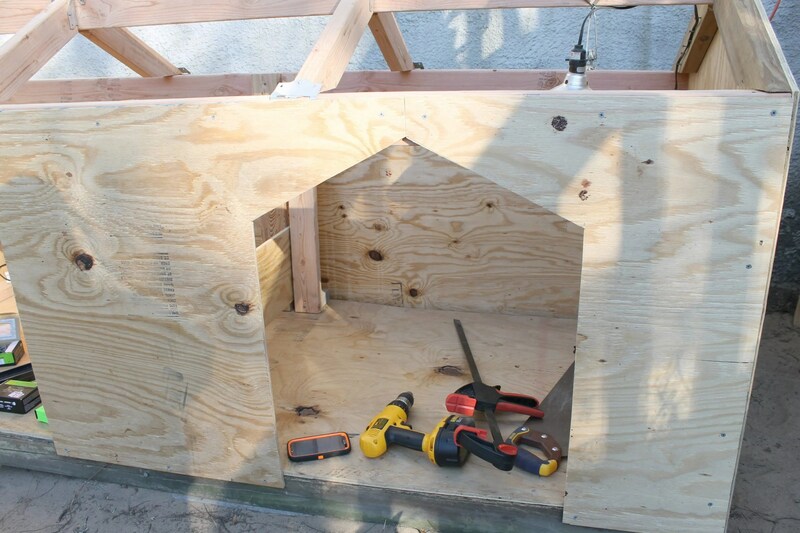 May we have permission to use a photo of the completed dog house in our roundup? This would include a photo credit attributed to Intelligent Domestications as well as a direct link back to this post and the website. Please let me know if this is possible. Thanks! Thank you so much for asking Rachel. Yes, please share with a link back. I just sent you an email. We actually painted the dog house white and I simply must update the pictures! Approximately how much did this project cost? I love the idea, we have a black lab and a German Shepard/Beagle mix who are outside doggies. Lacey, thank you so much for stopping by. This project was under $200. The most expensive item was the roofing material. It’s been a while now and we can’t remember exactly but know it was under $200. Wow can you send your hubby here to build me one too 🙂 It doesn’t get super cold in SoCal, but it does get cold enough where we put the dogs in the garage at night They would love this house to sleep in at night and we wouldn’t have to get up super duper early to let them out. Looks like a cozy little house to me. Great job to your hubby for building it! I do not have a dog…but there have been talks around here lately about dogs for the kiddos. Not sure if I could handle the extras, yet! Great job!. To have a handy hubby is so handy ;). Nice building, sharing! What a handy hubby you have! And it always makes me happy to see animals that are loved and appreciated. Sweet pups! I love your double dog house! Your husband did a great job! And your fur babies are so precious. Max is also an outside dog. His house is the large igloo looking thing, but he loves it. We just installed a wireless fence system and he’s caught on real well! Thanks, Alli. We actually purchased 2 of the Igloo dog houses. Both of our dogs refused to go inside. That is one of the reasons Stacy made big doors for these boys. They like to keep a close watch on squirrels and rabbits so they need to be able to see. They have the perfect view from their new location. Our dogs don’t like their Igloo dog houses either. Kind of a waste of money and I only find them in there if it is raining. Otherwise they like to plop down on the dirt or grass.